The second Portuguese novel I've read in the past few months, but the first I read in translation. I have a PDF of a first edition in Portuguese (it's in the public domain), and I allowed myself to dip into it occasionally to see whether the translator was being literal or making a choice, but mostly I read it on the bus. One aesthetic experience that will stay with me for a long time is a long description of a Decadent (in the generic, Wildean sense) party in Paris, designed to overwhelm partygoers' senses, and looking up to see the windows of the Gucci store on Michigan in unexpected hot pink, glowing eerily in the early darkness. The literary comparisons I want to make to Sá-Carneiro are (since it's my background) mostly English-language: Poe and Wilde and the Stevenson of Jekyll, and oddly enough Ben Hecht, which remind me to tell you about some time. But I'm getting my bearings enough in non-English-language literature to be able to note the French influence (of course, since Decadence took flight with Huysmans) as well as seeing lines of influence that follow it, such as Borges and Bioy Casares. I was reminded most strongly of The Invention of Morel when reading, although Sá-Carneiro never gives a full explanation for his (apparently unnatural) mystery. The story of Lucio's Confession is both unimportant to the ultimate effect and so important that it's worth discovering for yourself, but from a brief scan of the literature available online, interpretations are all over the place. For a hundred-odd page novel in which very little happens as such, it manages to pack in enough thematic content to be (potentially) a major text in queer literature (masc homosexuality and transgender identity are both symbolically broached), a sly portrait of syphilitic insanity, a cutting parody of Sá-Carneiro's literary associates, all of the above, or something else entirely. Genuine eroticism is as difficult to get a feel for at the remove of more than a century (not to mention as dependent on the audience) as genuine humor or genuine sentiment, but even through the double-paned blur of translation Sá-Carneiro's hothouse visions are effective. The one major criticism I have of the book is purely editorial: Sá-Carneiro threw around italics profligately to draw attention to lines of unusual emotion or intensity. English prose styles are conventionally less demonstrative, and the translator could easily have dispensed with the emphatic italics. But I really adored this little book, which I hadn't been expecting to be so intriguing. 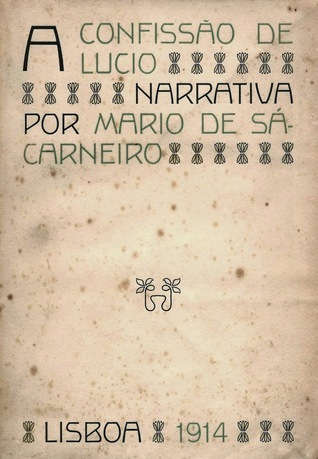 Apparently there's a book of Sá-Carneiro's short stories in English translation from the same publisher; I'm looking forward to tracking it down.